The last two bridges I photographed in the Port of Stockton are the Stockton Channel Viaducts (29 0176L/R). 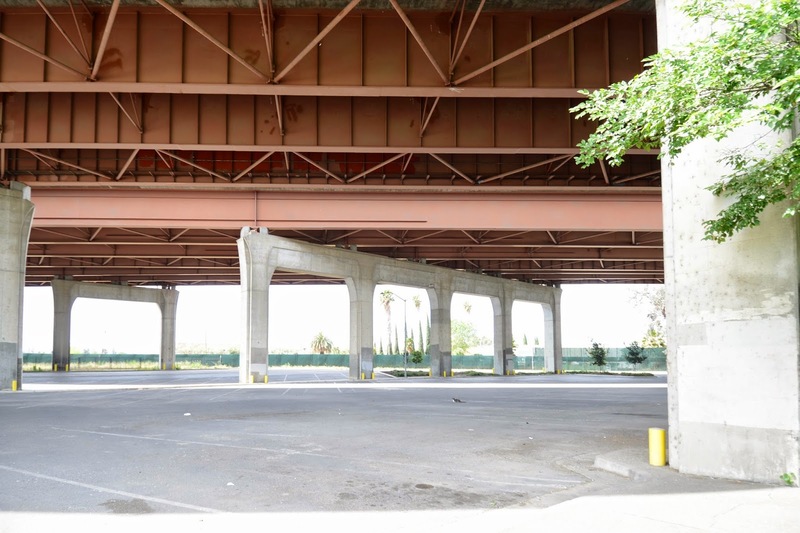 These are parallel 13 span steel girder bridges built in 1972 and seismically retrofit in 1996. The Port of Stockton receives large ships many miles inland through the Carquinez Straits and the California Delta through dredged channels. The viaducts carry Interstate 5 (The main north-south expressway in California) over the Port. The viaducts are on a 57 degree skew. Their total length is 2725 ft with 360 ft long haunched girder spans over the channel. Each bridge is 66 ft wide and provides 50 ft vertical clearance above the channel on multicolumn bents. The bridges carry about 60,000 vehicles a day with 23% truck traffic and are in satisfactory condition. We happened to be visiting these bridges on the Sunday before Cinco de Mayo, and all the streets were blocked with thousands of people preparing for a huge parade.